Mayflies are the symbol par excellence for fly fishing! These insects are no less than 2-3cm large and belong to the order Ephemeroptera. Many yellow and grayish fly patterns imitate the Ephemera Danica. As the name suggests, Mayflies hatch first in May, in cool areas a little later, in warm places a little earlier! Therefore exists also the so called "Mayfly-time" that is long-yearned-for from fly fishermen. During the mostly short and repetitive mass hatch of Mayflies, the biggest challenge is to serve our artificial fly tastier than the real insects (there are an enormous number of real Mayflies on the water surface, so it's not easy). 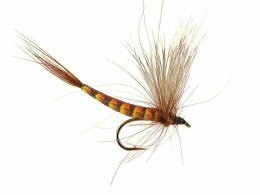 But often the duns are uncared by trouts and graylings, because they concentrate more on the easy to catch spent flies that float dead on the surface of the water.